In 2011, NASA and Sally Ride Science installed a new camera system on the International Space Station. This camera system is responsible for taking and downloading student image requests. The camera is mounted in a downward-pointing window on the ISS. 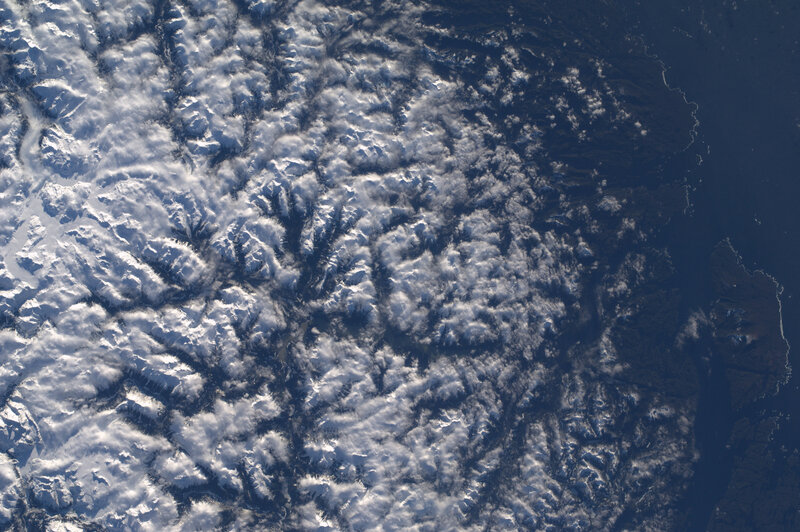 Sally Ride EarthKAM Image Winter 2011 #9362: The test photo is of an area of British Columbia, Canada, just north of Vancouver Island. North is toward the bottom of the photo. Flipping the image makes geographic orientation easier, and since the view is nearly straight down, the perspective of view changes little. The photo center point is approximately 51° 48' N, 127° 54' W.
The main islands in the photo to the west (on the right side of the photo) from south to north are Calvert Island and Hecate Island. The southern end of Hunter Island is visible north of Hecate Island. The main glacier field in the southeast corner (upper left) of the photo is Mount Somolenko, which is about 2,658 m (8,720 feet) tall. Mount Somolenko is a volcanic peak, located 83 km (52 miles) east of Rivers Inlet and 7 km (4.3 miles) south of Mount Silverthrone. 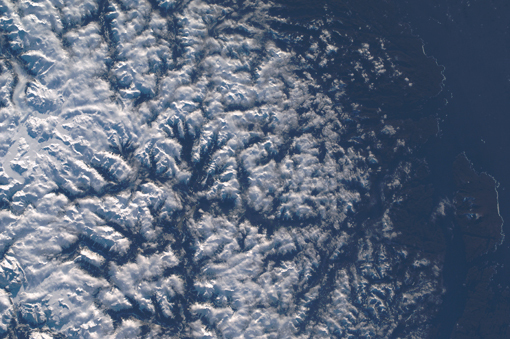 It is the highest peak south of Mount Silverthrone in the Ha-Iltzuk Icefield. Mount Somolenko lies in a circular volcanic depression, called the Silverthrone Caldera, in the Pacific Ranges of the Coast Mountains. While this is not a particularly unusual Earth Observation image, it is notable that even though this image was taken with a wider angle 50mm lens and is approximately 200 km (124 miles) across by 134 km (83 miles) tall, it can be enlarged by more than 400 percent with features remaining identifiable. This is only made possible by the high-quality optics of the Lab Window to which the crew had full access for the first time since the Destiny module was launched, thanks to the Window Observational Research Facility (WORF) and the ISS AgCam (ISSAC) Bump Shields. Also aiding in improving image quality is the mounting stability provided by the WORF and its small camera bracket, also in use for the first time. Details on the WORF can be found at: ReelNASA WORF Video Part 1 of 2 and ReelNASA WORF Video Part 2 of 2. Sally Ride EarthKAM is using the Nikon D2Xs Digital Camera, controlled by the Lenovo (IBM) T61p Laptop. 6.2 x 5.9 x 3.4 in.